Born: August 31, 12 C. E.
Died: January 24, 41 C.E. Caligula (12–41 C. E.) was the third emperor of Rome. During his short reign, Caligula emerged as one of the most dominant leaders of Rome's early emperors. But his insanity, coupled with his power as Emperor of Rome, would secure him a most unusual legacy. 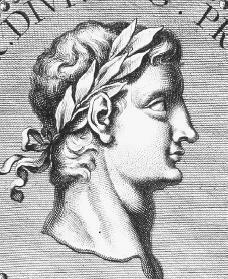 Caligula was born Gaius Julius Caesar Germanicus in Antium (modern Anzio) on August 31, 12 C.E. His mother, Agrippina, was the granddaughter of Emperor Augustus (63 B.C.E. –14 C. E.). Caligula's father, Germanicus, was Emperor Tiberius's (42 B.C.E. –37 B.C.E. ) nephew, adopted son, and heir who would inherit his father's throne. Gaius was brought up among the soldiers his father commanded on the Rhine, a river in central Europe. His mother dressed the young boy in the uniform of a Roman soldier, and for this reason the soldiers called him Caligula ("Little Boots"), the name by which he is commonly known. In 41 C.E. Augustus died, leaving Tiberius to inherit the role of emperor. Tiberius hesitated at naming a successor. Although Caligula's father was the best candidate, Tiberius was jealous of him and kept Germanicus away from Rome for several years. In 19 C.E. Germanicus died under mysterious circumstances. His death was mourned throughout the empire, because he was, by all accounts, an honorable and courageous man. After his father's death Caligula lived in Rome, first with his mother, then with Livia (Augustus's wife), and then with his grandmother. Finally, in 32 C.E. , he joined Tiberius in his retirement on the island of Capri. By this time Tiberius had groomed his two sons, Nero and Drusus, to succeed him as emperor. But by 33 C.E. , Nero and Drusus had died, leaving Caligula next in line to succeed Tiberius. Caligula held public office in 31 and 33 C.E. but, apart from that brief experience, had no other training for political life. Caligula's experience at Tiberius's court seems largely to have been in the art of hiding what his biographer Suetonius (c. 69–122 C. E.) called his "natural cruelty and viciousness." Tiberius died in 37 C.E. , and in March Caligula took the throne as emperor. During the first months of his reign he dissolved the legacies Tiberius and Livia left to the Roman people. The new emperor was generous. He freed political prisoners and established popular and splendid games and chariot races. He was respectful to the Senate and adopted his cousin Tiberius Gemellus as his son and heir. Caligula also recalled political exiles, or people who had been forced to leave Rome during the reigns of previous emperors. But by the spring of 38 C.E. the character of Caligula's rule changed drastically. An illness late in 37 C.E. seemed to have seriously affected his mind. Suetonius claims that, after the illness, Caligula submitted completely to the role of Oriental despot, or absolute ruler. He soon regarded himself as a god. Personal altars to himself were built all over his empire. In all things he became irrational and cruel. He murdered, among others, Tiberius Gemellus, humiliated the Senate, and spent money recklessly. He revived treason trials so that he could confiscate the property of the convicted. Caligula's behavior included building a bridge that crossed between his palace and nearby temples so he could communicate with the gods. Also, he appointed his favorite horse as high priest. Caligula spent the winter of 39 and 40 C.E. in Gaul and on the Rhine and planned to invade Germany or Britain. His plans aroused some patriotic support, but the project was soon abandoned. After his return to Rome, Caligula lived in constant fear of an assassination (an organized murder). His fear was realized when a tribune, or group of Roman officials, of the Praetorian Guards murdered him on Jan. 24, 41 C.E. His fourth wife and his daughter, who was his only child, were murdered at the same time. Balsdon, J. P. V. D. The Emperor Gaius (Caligula). Westport, CT: Greenwood Press, 1977. Barrett, Anthony. Caligula: The Corruption of Power. New York: Simon & Schuster, 1991. Ferrill, Arther. Caligula: Emperor of Rome. London: Thames and Hudson, 1991.